Zone 2 Rated Dive System delivered within four months of winning the contract. The ABS 3 CON 1800 is a compact three container air dive system with an 1800 DDC. HP air storage banks are integrated into the containers for reduced deck space, mobilisation time and better weather protection. Unique Group’s Diving & Life Support division was selected to build an ABS Classed, Zone 2 rated, Air/Nitrox Diving System by FSDS Diving Services in August 2016 and we delivered within four months by February 2017. 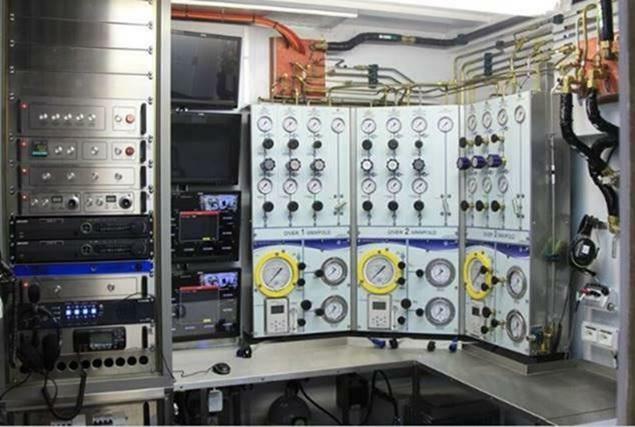 The client had a requirement for a Zone rated system which is used on diving projects on FPSO’s (Floating production storage and offloading) where there is risk of hazardous and flammable gas clouds such as H2S. These systems are to be designed for continuous operations during a gas cloud. The diving system is enclosed in pressurised and fire rated containers. The containers are kept safe using gas protection systems and control over-pressurised spaces. The Diving & Life Support division of Unique Group successfully delivered a state-of-the-art, Zone 2 rated, Classed Surface Nitrox Dive system to FSDS Diving Services, the Asian based subsea service provider within four months of winning the contract. The Zone rating of the dive system was designed by highly specialised engineers at Unique Group with full compliance to ATEX and the latest IMCA guidelines for safe and effective diving operations. The workshop facilities in South Africa and UAE worked in conjunction to have the system delivered on time.